ItemE-08524 - Harvest Of Logs, Arrowhead Lumber Co.
ItemE-08525 - Dickinson's Landing, Arrowhead Lumber Co.
ItemE-08527 - Dickinson's Camp, Arrowhead Lumber Co.
ItemE-08528 - Prize Load Of Logs, Arrowhead Lumber Co.
ItemE-08530 - "E.J. Branford and Company, Camborne, BC; freighting on Arrow Lake from Arrow Head to Beaton, BC"
ItemE-08934 - Princess Margaret in Kelowna. ItemF-00163 - Cherry And Creech Furniture, 41 Fort Street, Victoria. Item E-08530 - "E.J. 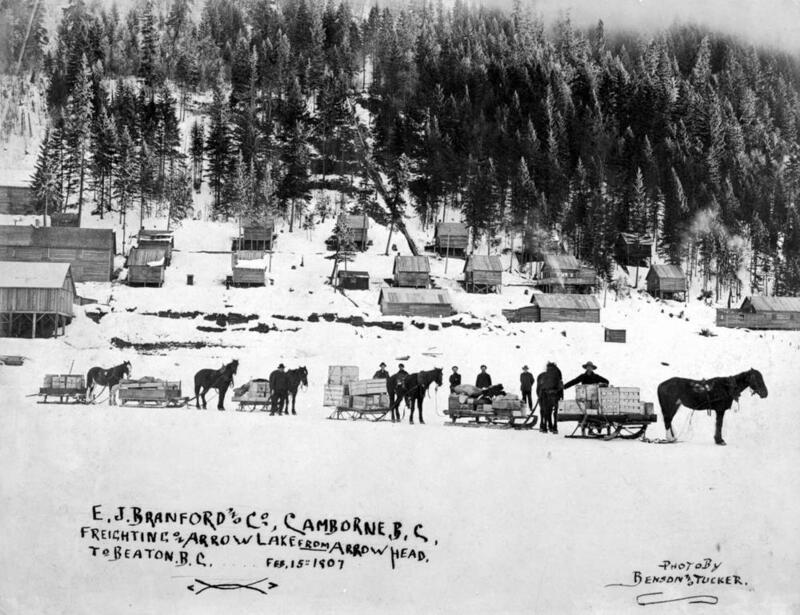 Branford and Company, Camborne, BC; freighting on Arrow Lake from Arrow Head to Beaton, BC"